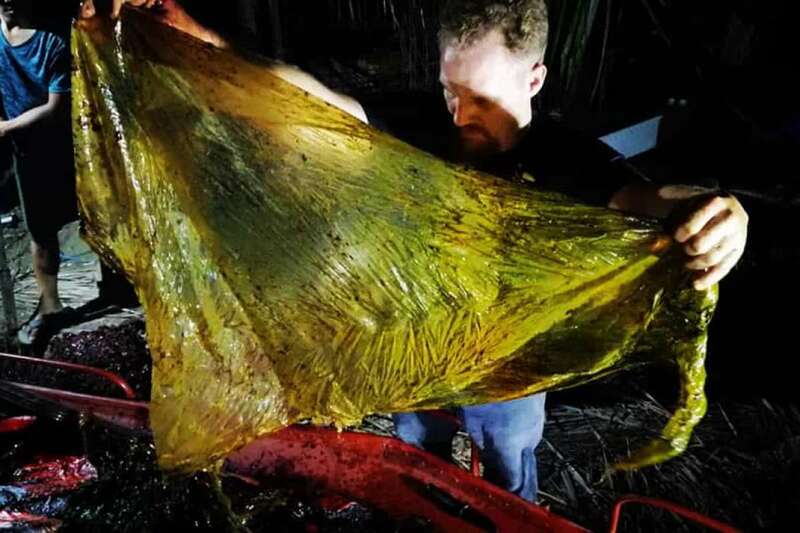 Marine experts in the Philippines say a dead whale found with 40kg of rice sacks and other plastic bags was the worst case they have ever encountered of an animal killed by plastic. The Cuvier’s Beaked Whale (Ziphius cavirostris) was found on the shores of Sitio Asinan in the Philippines on Saturday morning, and an overnight examination Saturday confirmed it had died of starvation and dehydration due to plastic. 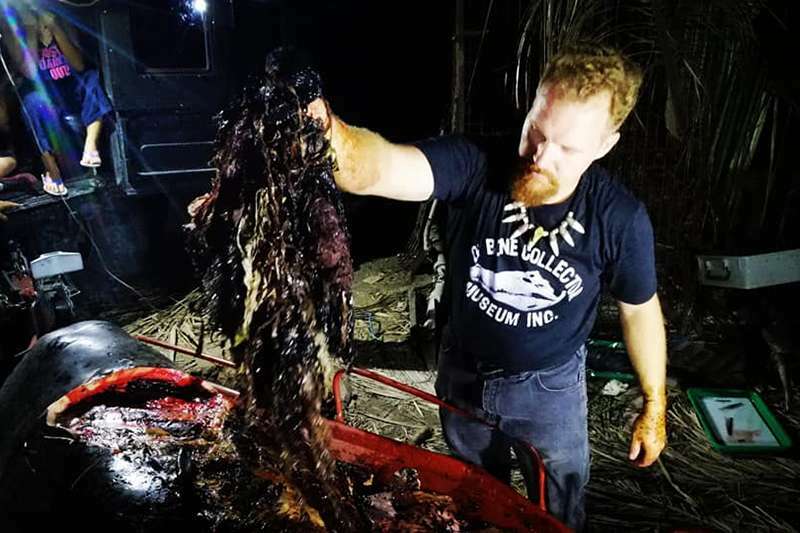 “Upon reaching the stomach I knew this whale had died due to plastic ingestion. I was not prepared for the amount of plastic,” says Darrell Blatchley, founder of the D’Bone Collector Museum, which carried out the necropsy. The museum has recovered 61 whales and dolphins in the past ten years, in partnership with the government’s bureau of fisheries, and found 57 of them have died from ingesting plastic. “This one was the worst we’ve ever seen,” says Blatchley. Plastic in and of itself is not yet thought to harm the animals, but it can compact their stomach and stop food from getting to their intestines, preventing them from digesting food, from which whales also get freshwater. In this case, the amount of plastic was so bad that the whale’s stomach was starting to digest itself. The Philippines ranks as the second worst country in the world, behind China, for the amount of plastic waste it discharges into the oceans. Blatchley says awareness of the problem in the country is rising because the government has been begun taking action on plastic pollution, such as temporarily shutting resorts over waste. How big a problem is plastic pollution in the UK? While whales are dying from ingesting plastic in the Philippines, the problem is not a universal one and needs putting into context. In the UK, plastic pollution is not an issue that greatly affects marine animals, says one of the country’s top cetacean experts. “It’s pretty rare. Whales and dolphins are too smart to mistake a plastic bag for a squid or a fish. They have sophisticated sonar,” says Paul Jepson of the UK Cetacean Strandings Investigation Programme. Only one of more than 4,000 cetaceans examined around the UK by the group since 1990, a Cuvier’s beaked whale found in Scotland, died from plastic. “You just need one photo to go viral and that makes the problem appear worse than it is,” says Jepson.